We don't have our own thread so thought I'd make one. Noticed Michael Wallace is in the team photo so maybe he will eventually get a chance?and Chris Scott seems to have left, not in photo and his mum commented something saying he'll miss someone. Noticed that aswell...... Seems strange? I was just going to point out that, although I'm obviously absolutely delighted with our start to the season, how many minutes have our own youngsters played in competitive fixtures this season? Off the top of my head, I don't think Connor Birse, Keiran McWalter or Chris Scott have had a single minute of competitive football so far? Or did Keiran come on for a few minutes against Alloa in the cup? This is a team that are still bedding in and getting to know each other (including management). Its always difficult to change a winning team. The guys on the fringe will come in...no doubt. But from a management point of view this is exactly what you want. I'm sure I read somewhere, all the players are desperate to play. The ones that have got the shirt will know this and hopefully try harder to keep it! Moore has already got the team spirit going and will use some of the characters (he speaks of) and more experience players to keep it going. What the players need to understand, is they have now become the early targets in this league and most of the teams they'll play will raise their game against us. Delighted by the way we've started the season but i am disappointed the youngsters that came through have not had a chance. Especially seeing as we're in the bottom tier and moore seems to like younger players. Dont blame chris scott for leaving. Moore has signed. Buchan 20, Smith, 20, El Zubaidi 19, Lowdon 22, Hunter 21, Stewart 19. Add that to Murray 22, Travis 21 then we do have a really youthful squad. Personally think only Scott was capable of making an impact so disappointed he's gone. Anyone else's away top really bobbly? ATB Kiffy Hope it works out for you. I also see a Pat Smith scored two goals for Carnoustie Pamure yesterday,I wonder if it was our ex youth team striker. 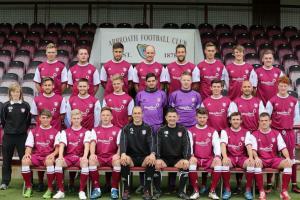 THERE is some good news for fans of The Red Lichties at Saturday’s home game against East Fife. Having previously expressed concerns about the future of the Matchday Programme, we are pleased to announce that this weekend’s edition will have an exciting new-look, what’s more it will be full-colour and glossy! There will be some great features, plenty of stats and top-quality photography – all for £2. Copies of the Matchday Programme will be on sale from the usual outlets on Saturday. If you haven’t purchased a copy for a while, then please do so as you are in for a real treat. If any supporters have pictures of their Arbroath FC colours in weird and wonderful destinations are the world, please email them to [email protected] for use in future editions of your new-look Matchday Programme. Allan Moore has won manager of the month for League 2 for August. With a perfect start and one of the few teams left in the UK with a 100% record it would have been a crime if he hadn't. According to the courier we are also in talks to sign attacking midfielder Dylan Carrerio on loan from Dundee. 19 and former Queen's Park Rangers player. I saw carreiro for Dundee u-20s and he looked class. Think he's Canada's u-20s captain as well. Good passer and runner and didn't shy out of a tackle either. Imagine he would replace Stewart in midfield, would be harsh though, unless we play 1 up top and have Stewart carreiro and hunter as a midfield 3.